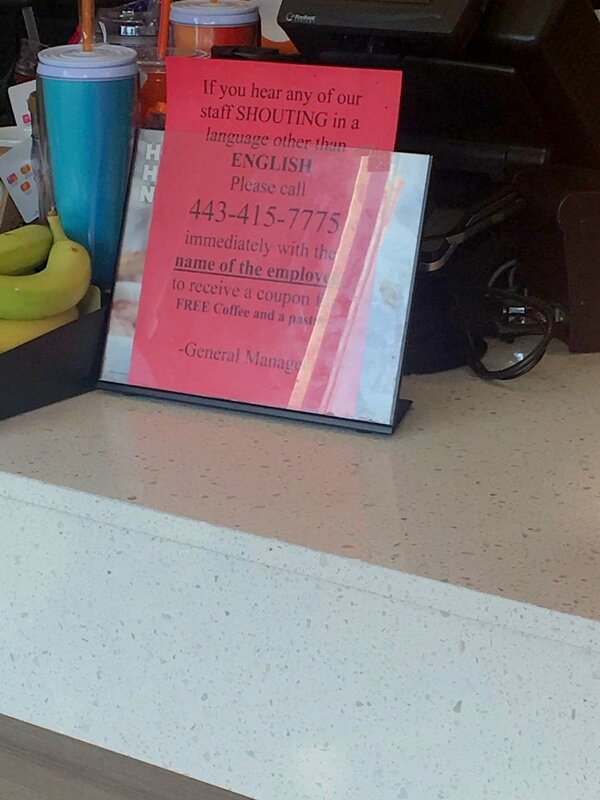 “If you hear any of our staff SHOUTING in a language other than ENGLISH Please call 443-415-7775 immediately with the name of the employee to receive a coupon for FREE Coffee and a pastry,” said the sign, posted on the counter at the store on 41st Street in the Greenspring Tower Square shopping plaza. Positioned near the cash register this morning – and attributed to an unnamed “General Manager” – the sign was posted on Twitter by Gillian Morley, a producer at WBAL TV, which is located nearby. A company spokesman has said the doughnut-and-coffee chain is looking into the matter [UPDATE: COMPANY RESPONSE BELOW]. Condemnation online, meanwhile, was swift and severe with many calling the sign racist and queuing up a #boycottdunkindonuts hashtag. “I won’t be going to@dunkindonuts until this is addressed publicly and the racist is dealt with,” said @StephSPrice. “I guess@dunkindonuts is cool with racism. Hello, Starbucks!” said another commenter, referencing the incident at a Philadelphia Starbucks in which a manager called the police on two African-American men. 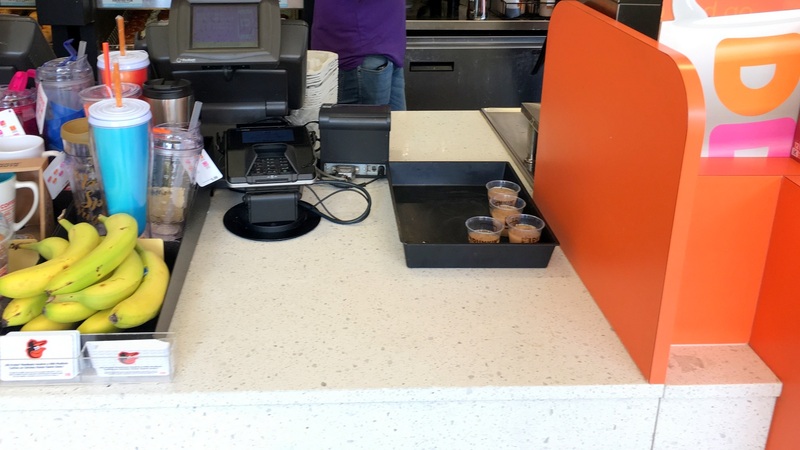 At the Baltimore Dunkin’ Donuts, the sign was gone by 11:40 a.m. when The Brew arrived. An assistant manager declined to answer questions about it, directing several reporters to call the company’s corporate headquarters. “I’m not answering, I’m just saying: whatever information you need, talk to them about it,” said Abhi Sheth, an assistant manager. He pointed to a tray of free iced coffee samples and asked the reporters if they would like one. The number on the sign – 443-415-7775 – went right to voicemail when The Brew called. But a man answered the phone earlier in the day when called by WBAL, which broke the story. “Dunkin’ Donuts and our franchisees share the goal of creating a welcoming and hospitable environment for all guests,” said Lindsay Cronin, senior manager of public relations for Dunkin’ Brands Group, Inc.
Reflections on the police department’s failure to charge the man who yelled “Heil Hitler” at the Hippodrome. Appointed to fill a senate vacancy, Carter announced that she will resign as director of Baltimore’s Civil Rights office. But she may return as deputy director. UPDATED with Carter remarks.